Since I’ve started blogging about traveling with my children I’ve become, what CAM disdainfully calls, a ‘paparazzi mom’. 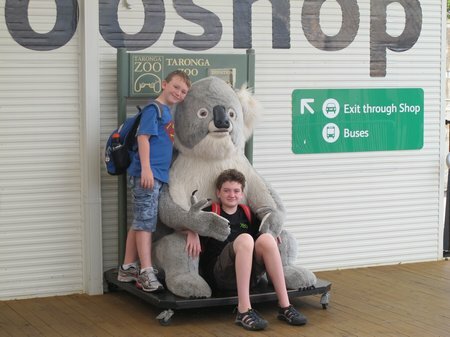 Hence, when we arrived at the Taronga Zoo in Sydney, I just had to get a photo of the boys with this over-sized Koala. And then I left the camera with my kids while I picked up a coffee. My back was turned for less than five minutes but I didn’t discover the photos they took when I wasn’t looking until some time later. Not cute. Mischievous. That’s my boys. This post is part of a Photo Friday series. Information on planning a visit to Australia. 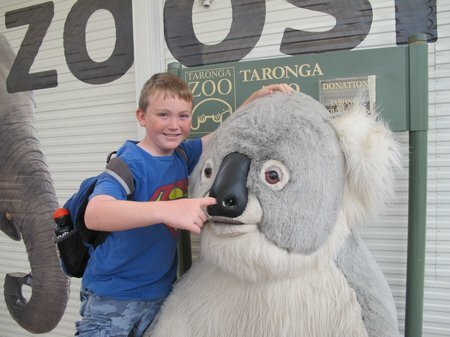 This entry was posted in Australia, Kid Travel Photos and tagged Australia, Sydney, Taronga Zoo on January 21, 2010 by wandermom. I’m very excited to announce my first ever destination page on WanderMom.com: check out Sydney With Kids. If you’re planning a trip to Australia with your children, I hope you find the information on that page helpful. (You’ll be able to quickly find this page on the Destinations section on the Home Page). I plan to add more destination pages as we continue our travels this year, particularly once we start our extended adventures this coming September. 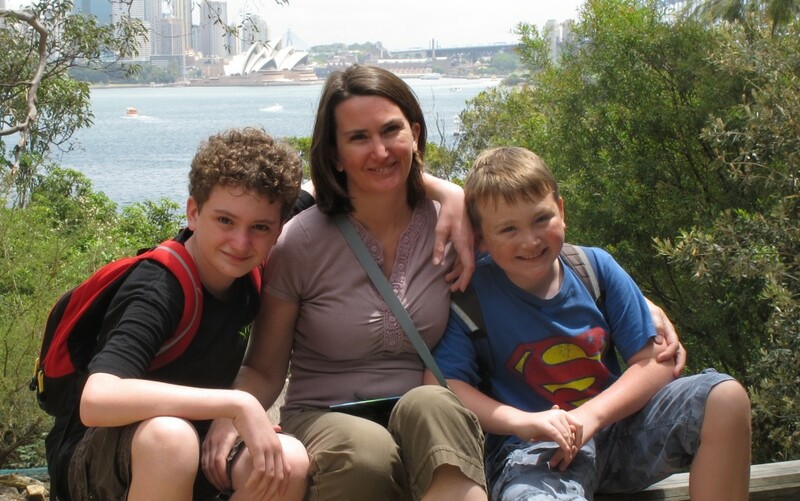 This entry was posted in Advice And Resources and tagged Australia, Family Travel Destinations, Sydney on January 19, 2010 by wandermom. I’ve already said that my boys rated the beaches the best part of our visit to Sydney and that our visit to the Powerhouse Museum was great fun, very educational and very good value. As with any vacation with extended family, we spent a lot of time hanging out and enjoying each other’s company. That said, we did visit three other family attractions in Sydney which are worthy of note. By the time I finished paying for us to walk into the Sydney Aquarium I was teetering on the edge of a major mommy meltdown. My children had put up a full-scale “No, I won’t go, you can’t make me” argument to the proposition of visiting the Aquarium. I won’t bore you with the details. Let’s just say that they railed, I held firm, they pushed some more, I cajoled and pleaded and then, in a last-ditch appeal to their fondness for their new cousin, I pointed out that it would be LittleL’s first visit to the Aquarium and wouldn’t they want to be part of that experience, since, who knew, it could be years before they saw him again? A little underhanded I know, but better than bribery – if only marginally. We were a grumpy crew passing through the Aquarium turnstiles. Within five minutes BigB exclaimed, “Wow! This is the best Aquarium ever!”. At AU$85 (US$77) for a family ticket, I think the Sydney Aquarium is expensive. 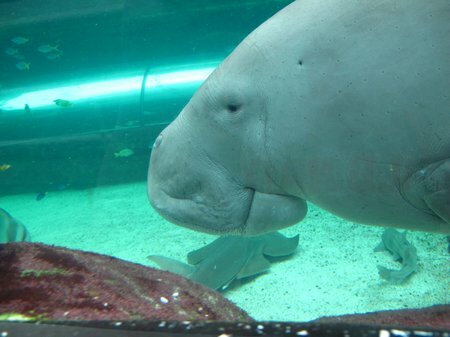 That said, the Dugongs and the oceanarium easily make the visit worthwhile. The exhibits are organized into Southern Rivers, Northern Rivers, Southern Oceans and Northern Oceans – not that this really matters when you’re chasing kids around a dimly-lit room with sharks swimming overhead. CAM took countless photos of the platypus and we got to see the dugongs happily chomping on monster heads of lettuce. LittleL won’t remember this visit, but I’m sure his “big boy” cousins will be happy to remind him of what he missed while he was fed, burped, changed and fed again. And no, I didn’t say “I told you so” once. I think. If I told you I spent AU$22 (US$20), got to work out, got to watch my kids play happily, had a coffee and read my book in peace for an hour I think you’d agree that was a pretty good deal, don’t you think? That was our afternoon at the Sydney Olympic Park Aquatic Center. When we visited Melbourne in 2000, I swam some laps in the Melbourne Olympic Aquatic center and thought I’d died and gone to heaven (I know, it doesn’t take much to make me feel special). Visiting the Olympic facilities in Sydney was definitely on my must-see list for this trip. My boys were not as enthusiastic as I, but a picnic in the sun outside the pool complex perked up their spirits. Not being inclined to consider swimming laps fun per se, they were initially under-impressed by the water playground. But I was on a bit of a mission and so I shoo-ed them off to check out the slides, fountains and rapid river in the playground and generally left them to their own devices. By the time I finished my “fun” and went to check on them, they were having a blast. 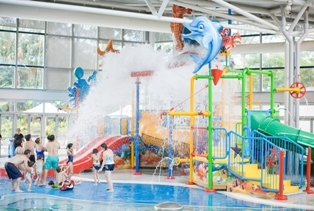 There’s a gigantic bucket atop the water playground which fills with water, and, every 10-to-15 minutes, dumps said water onto the decking and pool below. Apparently that’s all that’s needed to keep a whole bunch of kids entertained for hours. And lying on the deck waiting to get cold water dumped on you seems to be the new best way to make friends with other kids in a pool. Who knew? All-in-all a very fun three or so hours. I had to bribe my boys with food to to get them out of the pool. Even though the Sydney Olympic Park Aquatic Center is a fair distance from downtown Sydney (30 minutes in the car or 45 minutes by ferry), I highly recommend checking it out. For me, Australia’s flora and fauna are a big part of what makes Australia different and interesting. Traveling as a solo parent, much as I might have liked to get my kids out of the city and into the wilds to see animals in their natural environment, that really wasn’t a practical option. The Taronga Zoo was the next best thing – and it is an excellent zoo. As you enter the zoo (at the main entrance), the path splits, with Australian animals to your left and Asian and African animals to your right. The paths merge at the bottom of the hill at the Southern Oceans exhibit (the seals and penguins). We stuck to the left path and saw koalas, wombats and plenty of exotic birds. Unfortunately, the kangaroos were really not in the mood to see us, but after check-ing and re-checking that exhibit area we finally got to see a Red Kangaroo. The Backyard to Bush exhibit is hands-down the best integrated presentation I’ve ever seen on how humans and animals co-exist, educating about animals which live in and around our homes – from insects to domestic pets – and highlighting simple ways in which we can all be more environmentally friendly. The garden has a pit toilet, a recycling station and a kitchen garden with information on how co-planting helps plants and animals. This real home in the zoo then leads into a petting zoo with a playground for younger children. 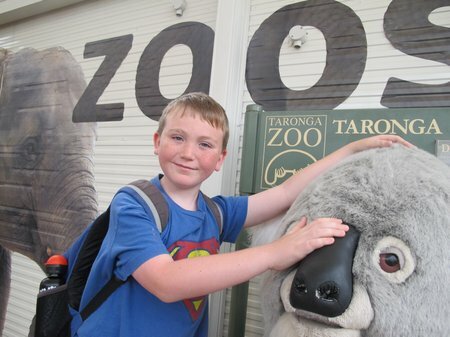 The big – and surprise – hit of our visit to Taronga Zoo was the wombat enclosure. As I was ooh-ing at the sleeping wombats, BigB disappeared out of sight. Thankfully, he wasn’t too far away. Towards the end of wombat area, tucked into an alcove which you’d easily miss, there is display showing animated videos of stories of animals in The Dreaming. I’d been looking for a way to introduce this important part of Australian culture to my boys, but there hadn’t really been an opportunity. Both boys were fascinated by the stories (I’m sure the animation helped) – so much so that within days we were in a bookstore picking up some books of these stories as souvenirs of our trip. This entry was posted in Australia, International Escapades and tagged Australia, Sydney, Sydney Aquarium, Sydney Olympic Park Aquatic Center, Taronga Zoo on January 5, 2010 by wandermom. 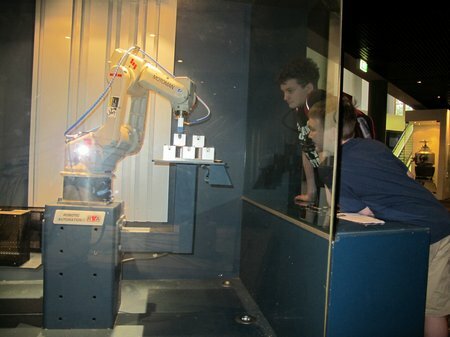 Our visit to the Powerhouse Museum was one of the highlights of our recent trip to Sydney. I’ll be up-front about this: my boys love technology. When they were younger we regularly visited Seattle’s fine Woodland Park Zoo but as they got older and (loudly) voiced their preference in selecting family activities, the Pacific Science Center won their vote hands down every time. 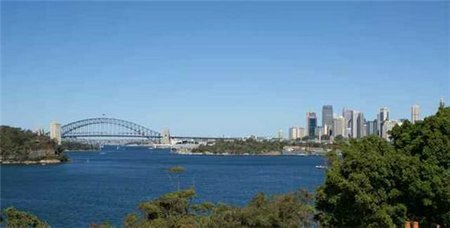 I knew that if I was to have any hope of convincing them to come with me to the famous Taronga Zoo or extremely popular Sydney Aquarium I would need to start our “proper” sightseeing in Sydney with something which they would really enjoy. The Powerhouse Museum seemed to fit the bill perfectly. At AUD$40 for all of us, it also ended up being the best value for money of all the attractions we visited. We spent three very enjoyable hours at the museum and would have spent even longer there had I not goofed up our lunch plans – but more on that later. I think I’ve been to enough science and technology museums to judge that the Powerhouse Museum really has a fantastic set of exhibits. The exhibit space is well organized, well labeled and with a good balance of interactive versus observational material. We spent most of our time in just two exhibits: Cyberworlds and Experimentations. My weary travelers were grumbling about having to go to a museum when we made our way into the Cyberworlds area at the start of our visit. The video of Ada Lovelace taking Charles Babbage forward through time to see the effects his Difference Engine had on the world was fun – if the acting was more than a little hokey – and held my children’s attention from start to finish (about 10mins) without a single fidget (remarkable!). Following on to learn about Alan Turing and his work in deciphering the German Enigma codes during WWII was an easy transition. CAM, having just read Turing’s biography as a school project was particularly intrigued. 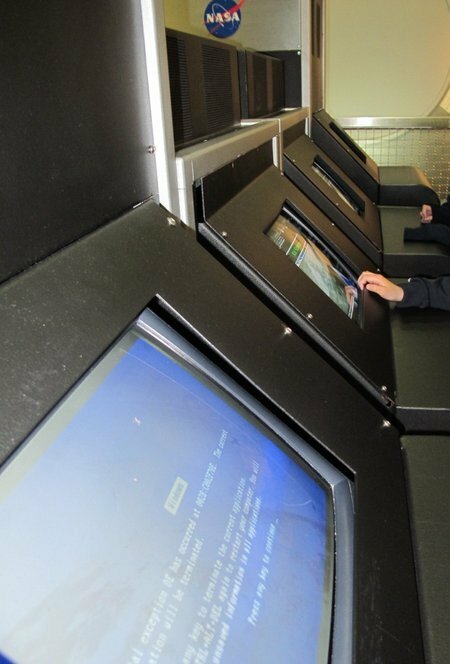 The rest of the Cyberworlds exhibit has interactive stations where visitors can play with digital photography – including adding sounds and image effects to a mini-movie – and large displays on the history and use of digital control systems, in traffic management for example. There are also plenty of items cataloging the evolution of the devices we use to interact with technology. My kids fell over themselves laughing when BigB spotted “Mom’s funky keyboard” (a Kenesis Contoured) on display. We continued into the Experimentations area. This exhibit area is made up of multiple rooms of interactive exhibits covering light, radioactivity, magnetism + electricity, chemistry, taste, smell and chocolate (my favorite). It seems to me that many science and technology museums present technical material in bright playful colors and short, punchy sentences – with little meaningful detail. Not so in this area of the Powerhouse Museum. 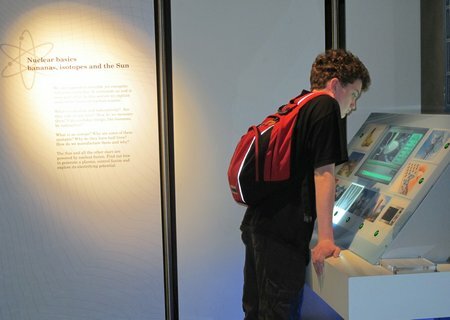 There’s plenty of detailed information on many of the exhibits especially in the section on radioactivity. Because of this, Experimentations was perfect for my older children and indeed, we spent nearly two hours just in this section ending by playing with the Motoman shown above. When BigB danced along to the Moto’s robotic disco moves I couldn’t help laughing but CAM, in true teenage style, was mortified by his brother’s antics. By this stage, it was well past lunch time and tempers were starting to fray. I had checked in advance and verified that there was a kid-friendly cafe on site. What I totally neglected to consider was the fact that kid-friendly food in one country is not always the same as kid-friendly food in another and try as I may, my super-food-fussy boys would not be convinced that the “tasty cheese toastie” advertised was really a toasted cheese sandwich. The vernacular in Australia borrows heavily from British Isles’ English which was fine by me, but not so much for my barely-over-jetlag American children. I should have just packed some peanut-butter-and-jelly sandwiches. And so our visit to the Powerhouse Museum came to a rather abrupt end but, based on even this partial visit I’d still highly recommend it as an excellent Sydney family activity. 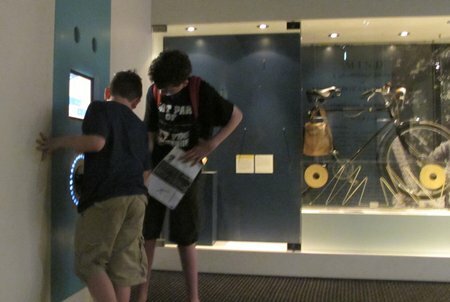 This entry was posted in Australia, International Escapades and tagged Australia, Powerhouse Museum, Sydney, Sydney With Kids on January 3, 2010 by wandermom. My husband and I both work in software. Our children, poor lambs, could type before they could write. Having a three-year-old who’s more technically literate than many most of the adults around him was extremely cool in 1999. Now, I’m paying the price. 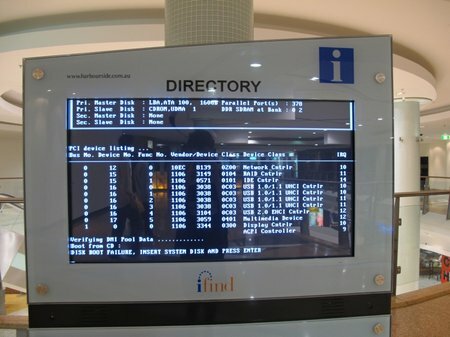 When we’re traveling, my child will take my camera and take detailed photos of technical glitches in information displays anywhere and everywhere we happen to come across them. The photo above was taken in Darling Harbour, Sydney. 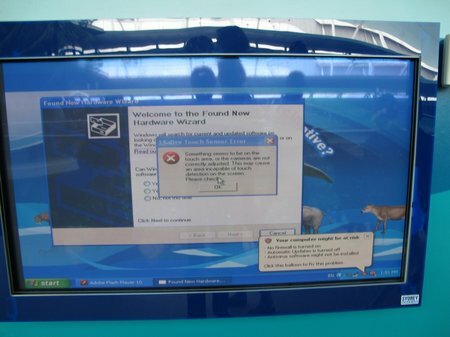 This display should have been showing information about Dugongs at the Sydney Aquarium. At the International Space Center stop on the bus tour of Kennedy Space Center. 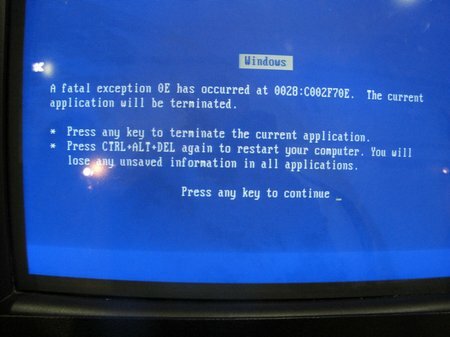 With the NASA logo visible in the background – you know, just in case you didn’t believe that NASA too suffers from the “blue screen of death”. This entry was posted in Australia and tagged Kennedy Space Center, Sydney, Sydney Aquarium on December 31, 2009 by wandermom. 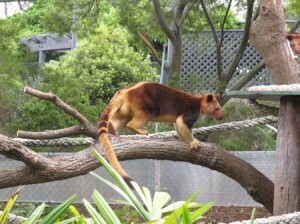 This entry was posted in Australia and tagged Australia, Sydney, Taronga Zoo on December 3, 2009 by wandermom. Today’s Photo Friday post comes from Sydney. We had a busy day out on our first day trying to stay outside and active so that we could stay awake until evening-time here. This is a strategy which I’ve used time and again to help my children adjust to a new timezone quickly. The down side is that it’s never an easy thing to do and yesterday I realized that it’s even trickier when traveling in ‘single parent mode’. Hence, I’m a little too discombobulated to write much today so let’s just get to the photos, shall we? LittleL examines CAM curiously. 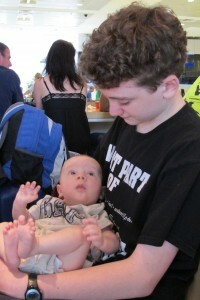 CAM eases into the role of capable older cousin with aplomb. LittleL wishes his mom would pay him a little more attention. Don’t worry folks, within minutes of taking this photo he was happily nursing – which his cousins found absolutely fascinating. 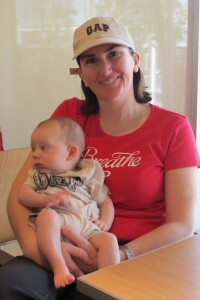 This entry was posted in Australia and tagged Australia, Sydney, Sydney Airport on November 20, 2009 by wandermom. What do you think folks? This is the Wondermap for my upcoming trip to Sydney. 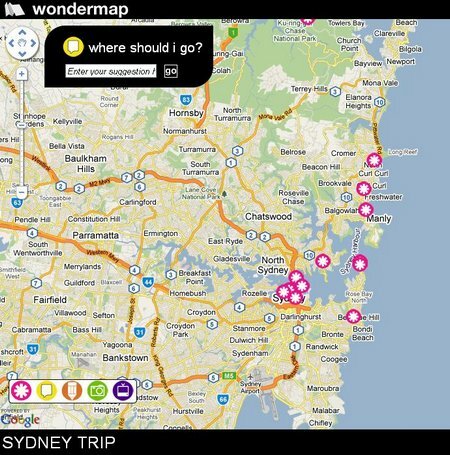 The pink icons are the Sydney attractions we’re currently planning to visit. If you follow the link, you can enter your suggestions for places to visit and things to do. I can associate blog posts, photos and vidoes with locations on the map. I’m very grateful for my friends at Travellious for allowing me to be an alpha-tester for this application. There are many, many things to do in Sydney – with or without children. I’ll be traveling on my own with my boys and we’ll be spending most of our time with my sister and her three-month-old so as I’ve been planning this trip, I’m assuming that long sightseeing days will really be out of the question – and that’s OK, those are the trade-offs you make when you travel with children. So, with that in mind, here’s everything on my “Sydney attractions must see” list. If there’s something you think we should try to include, please do leave a comment. Manly Beach, Bondi Beach (well, duh! 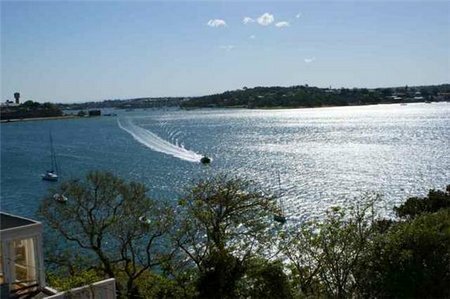 ), Watsons Bay – although this is partically an excuse to eat at Doyles, Freshwater Beach and the family-friendly Dee Why Beach. We’ll be trying to spend at least a couple of days doing ‘city sightseeing’ visiting the Opera House (the 1-hour tour), the Australia Museum, the Botanical Gardens (yes, Victorian as it is, I love walking around Botanical Gardens) but I suspect we may end up spending even more time at the Andrew (Boy) Charlton Pool that day. The Aquarium, the Taronga Zoo and the Powerhouse Museum are also on our list – although at this stage I know we’ve got way too much on our list and my money is on my geek-boys ditching the nature stuff and indulging their inner geeks at the Cyberworlds exhibit at the Powerhouse. If we can, we’ll be heading out of the city for at least a day or two. Currently we’re targeting Ku Ring Gai Chase National Park and Kangaroo Valley. We’re staying at a condo in Balmain (with a killer view of the harbor and the river, I might add) so I haven’t even thought about restaurants. That said, I think a grownup-style “date night with mom” may be possible with my boys; my sister and I are certainly planning to have a girl’s night out (baby permitting, and hey, if he comes too, it won’t be the end of the world); and I’ll be insisting on playing generous auntie at least once while I’m in Sydney and sending my sister and her husband out while I watch all three boys. So, folks, I’ve heard Sydney has some great restaurants. Which one do you think is worth checking out? Leave a comment or (even better) add it to the Wondermap. This entry was posted in Australia, International Escapades and tagged Australia, New South Wales, Sydney on November 15, 2009 by wandermom. 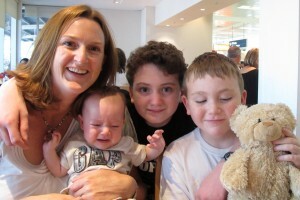 I’ll be traveling to Sydney with my boys (but without my husband) in November. We’ll be meeting a new family member – LittleL, who was born in July – for the first time. We were able to take advantage of Quantas’ sale earlier this year to pick up flights at a fairly reasonable price (~$600 each) but I didn’t start looking for somewhere to stay in Sydney until this month and now that I’ve finally sorted that out I can share my experience. I’m a huge fan of staying in vacation rentals when I travel with my family. It’s proven to be a good way for us find holiday accommodation which is more suitable for a family than a standard hotel room. We usually look for a one or two bedroom property with a kitchen so we can have separated sleeping spaces (so everyone gets a better night’s sleep) and we have the option of eating in rather than having to pay restaurant prices for every meal. I’ve been able to find well-appointed properties with per-night rates similar to three or four star hotels in many locations world-wide. For our trip to Sydney, I started my search with two constraints: the cost couldn’t be more than $150 – $200 per night and a property in Balmain – which is the neighborhood where my sister lives – would be ideal. Surprisingly, HomeAway.com, Vrbo.com and Rentalo.com had little or no vacation rental properties which met these criteria. When there is limited inventory with these familiar brands, I find that the next best thing to do is to look for a local (to your destination) property rental company. The trick is to find one for which you can find sufficient additional evidence showing that the company is a reliable entity from whom to rent. In this case, I found an Australian company, Rent-A-Home, which has a large selection of properties all over Australia. I’ve written before about tips for finding vacation rental accommodation. The Rent-A-Home website and the vacation rental property listings fulfilled all my criteria for clearly written property descriptions, full amenity listings, plenty of photos, customer reviews of properties and a responsive administrative staff. But booking a property became an issue. As the New York Times reported last week, many American travelers are finding that it’s not so easy to use your credit card overseas any more. My experience with this booking highlighted a different aspect of using a U.S. credit card for a purchase in another country. When I tried to pay Rent-A-Home the deposit on my chosen property, my visa card was rejected multiple times. After the first time, head-slapping myself for stupidity, I called the bank. I verified to them that the charge wasn’t fraudulent and they said that Rent-A-Home should be OK to re-process the charge. It was denied again. This was very frustrating. I wondered if I would be having the same experience if the merchant name was a well-known hotel chain? I was tempted to settle for a hotel room, but instead decided to try another credit card. I logged on to my American Express account and used their handy-dandy secure message center to send an email to Amex customer service informing them of my travel plans and the need to place a charge in AUD$ to book accommodation. I received a response within a day and attempted to pay Rent-A-Home again. This time the charge was processed immediately. If you have any suggestions for must-see attractions or activities in Sydney, leave a comment below. This entry was posted in Australia, International Escapades and tagged Accommodation, Australia, Rent-A-Home.com.au, Sydney, Sydney Vacation Rentals, Vacation Rentals on October 18, 2009 by wandermom.